Petroselinium crispum Heirloom Mature Height: 12-18" Hardy Biennial. Ships in a 4 inch pot. 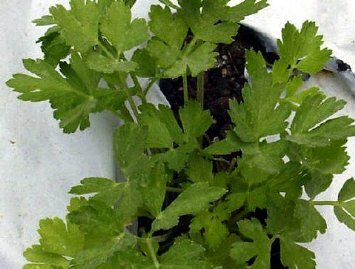 Italian Flat Leaf Parsley Petroselinium crispum Heirloom 12-18 in. Hardy Biennial This is our favorite for seasoning and drying. Introduced before 1806, its larger than normal leaves are a dark, glossy green with a stronger and more concentrated flavor than standard strains. Although there are more than 30 varieties of parsley, Italian Parsley is favored by both professional cooks and home chefs alike. Once highly praised by the Greeks, it was the Romans who actually were the first to consume the herb in large quantities. A slightly peppery, more strongly flavored herb than the more familiar varieties of parsley, Italian Parsley is an excellent source of vitamins A and C. Considered a beneficial/medicinal herb as well as an attractive garnish, Italian Parsley works well when combined with a variety of fresh vegetables including beets, cabbage, carrots, onions, tomatoes, and turnips. Transplant into the garden in rows 8-12 inches apart. Enrich soil with mature compost. Harvest outer leaves by gently twisting the stem away from the base of the plant. Can be used fresh, dried, or frozen.